shop Earth Friendly Ecos Dsny Free Clear 4x100OZ | bargainbrute. 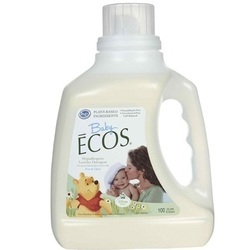 Baby ECOS Laundry Detergent is a hypoallergenic everyday laundry detergent that is gentle for baby's sensitive skin. Rinses thoroughly, leaving baby's laundry clean and soft with built-in fabric softener.